Hello there, This is the PP-VOE from VARIG to be used with IXEG 737-300 v1.21 Here you will find: - Gray Color correction - Oil in Flaps - Brighter window frames - New interior matching the old VARIG - Corrected baremetal surfaces - Dirty engines Hope you like. have good flights! Hello, IXEG pilots. After almost a year of development, I am close to finishing beta-testing of my iOS application for this great plane - iGoDispatch for IXEG's B733. This is a planning tool that includes a range of options, such as : creating a flight plan and uploading it to FMC as a co-route; estimating the required fuel taking into account X-Plane winds aloft (the first release will take into account winds aloft in US and the update is intended to include the grib wind data to be available in X-Plane 10.50) ; loading the plane with passengers, cargo and fuel; estimating and dynamically adjusting the CG offset during the flight; monitoring the flight on the map; creating a report on your flight performance; adding in-flight public announcements in 7 languages. I intend to release the iPad version of the application by end of summer. Versions for iPhone and iWatch are expected to be released later this year. Hope it will be a valuable addition to this plane! 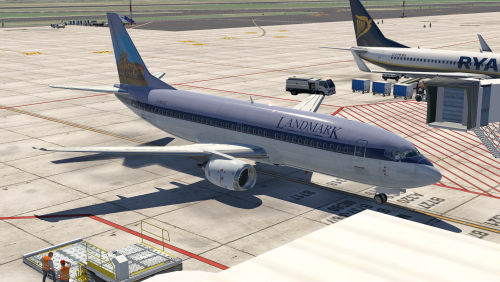 Remember the good old Landmark Airlines livery one could find in FS2004? If you missed it in X-Plane, here it is. Left Colosseum inverted as in the original FS2004 livery. Have fun and happy landings! Only tested with X-Plane11, should work with X-Plane 10 too. 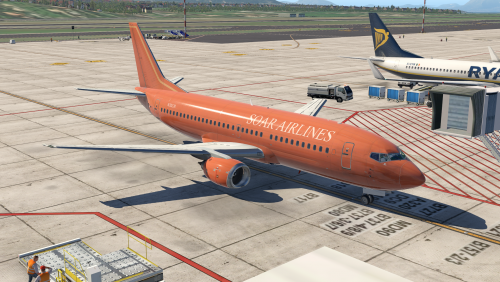 Remember the good old SOAR Airlines livery one could find in FS2004? If you missed it in X-Plane, here it is, altough it has never been a default livery for the 737-400 in FS2004. I have changed some things to make it a little more "smooth". Have fun and happy landings! Only tested with X-Plane11, should work with X-Plane 10 too. 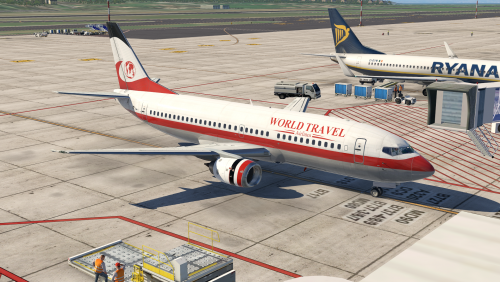 Remember the good old World Travel Airlines livery one could find in FS2004? If you missed it in X-Plane, here it is. I have changed some things to make it a little more "smooth". There are two versions. One ,which can be seen in the screenshots, with a saturated red tone, and one, with the red tone taken straight out of the FS2004 livery. It looks like tamato soup in X-Plane, hence a saturated version. Have fun and happy landings! Only tested with X-Plane11, should work with X-Plane 10 too. 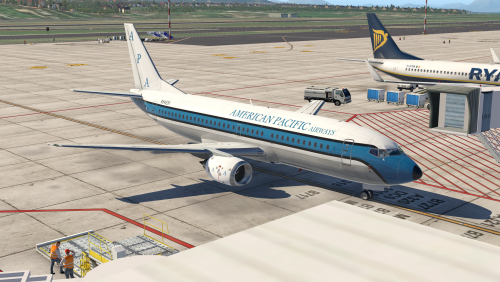 Remember the good old American Pacific Airways livery one could find in FS2004? If you missed it in X-Plane, here it is. I have changed some things to make it a little more "smooth". Have fun and happy landings! Only tested with X-Plane11, should work with X-Plane 10 too. 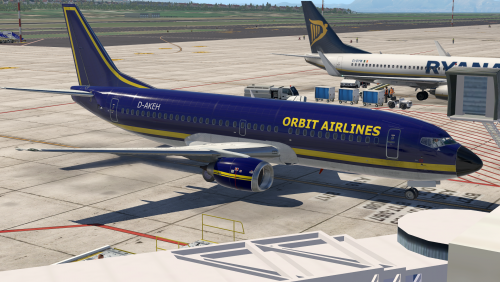 Remember the good old Orbit Airlines livery one could find in FS2004? If you missed it in X-Plane, here it is. I have changed some things to make it a little more "smooth". Have fun and happy landings! Only tested with X-Plane11, should work with X-Plane 10 too. Hello, IXEG733 users: I would like to know what third-part real weather plugin is required for IXEG737-300's weather radar to work properly. Do you have any recommended third-part weather plugins that are compatible with IXEG733's weather radar? I tried the ASXP, and it didn't work. 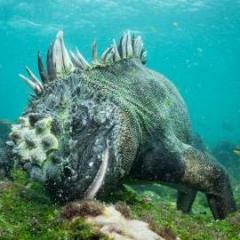 Please help me. Thank you very much! Regards. JET2.COM Holidays Livery FOR IXEG BOEING 737-300 MORE CLASSIC LIVERIES ON THE WAY ! ENJOY ! 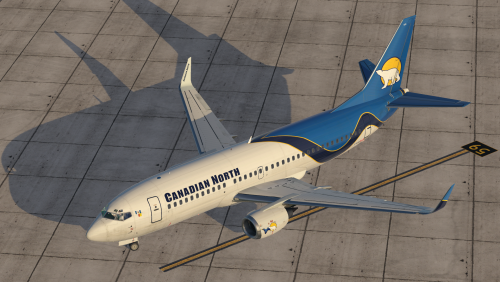 Canadian North CFL livery for the IXEG 737 Classic 737-300 (C-GCNO). Painted in "Canadian Football League" special colours Nov 2014. Model: 737-36N Construction number: 28596 Line number: 3112 Built: 1999-05-28 Delivered: 2014-09-17 Engine Model: CFM56-3C1 Enjoy. Hello team, I was practicing today the procedure during a failure after V1 and found that the behaviour of the IXEG is really hard to control. I have recorded a couple of videos so you can see what I mean. Basically I am failing engine 1 at 123 knots, V1 is 120 and the plane totally rolles to the left, out of the runway. I try to apply full rudder pedal to keep it in the center line of the runway but, until today, I have not been able to do so. I am using X-Plane 10 at MPTO, no wind, no rain, configured "ready to fly". This is the first video where I record from inside the cockpit: In this video we can see the replay from the outside: This third video is an actual practice of an engine failure after V1. It is an Airbus but what I want to show is how the pilot applies rudder control and is able to keep the plane flying nice and soft: I appreciate very much your feedback. Greetings!! !